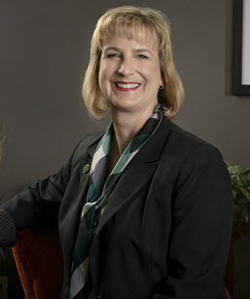 Cheryl B. Schrader, Ph.D., is the seventh president of Wright State University and the first woman to lead the university in its 50-year history. She took office July 1, 2017. In her first year at Wright State, Schrader plans to emphasize financial sustainability, administrative transparency, and campus conversation. She also plans to foster a campus atmosphere aimed at tackling broader domestic and global issues that will provide opportunities for graduates to excel in fields that will define the future. Schrader is planning to encourage innovative strategic approaches to university business and creativity in classrooms and laboratories. Prior to joining Wright State, Schrader served as the chancellor of Missouri University of Science and Technology in Rolla, Missouri, from 2012 to 2017. While at Missouri S&T, Schrader oversaw a comprehensive strategic planning effort that led to numerous successful initiatives, including an increase in state appropriations and public-private partnerships, the launch of a comprehensive campaign, a faculty hiring program, investment in Ph.D. support, and extensive capital improvements. Schrader previously served as associate vice president for strategic research initiatives at Boise State University and dean of the College of Engineering at Boise State. She held numerous academic positions at The University of Texas at San Antonio, including associate dean for graduate studies and research for the College of Engineering and the College of Sciences, university graduate recruitment coordinator and, associate director of the Center for Advanced Propulsion Studies. An accomplished electrical engineer, Schrader’s research background is in the area of systems and control. She has received several best paper awards; written more than 100 publications in the areas of systems and control, robotics, and intelligent systems, with biomedical, networking, and aircraft applications; and delivered more than 100 presentations and keynote addresses. Her grant and contract funding exceeds $11 million. Passionate about increasing interest in science, technology, engineering, and math, Schrader’s current research interests focus on creating and assessing innovative learning methods that help students of all ages succeed in STEM areas. Her classroom experience includes teaching courses in the Department of Electrical and Computer Engineering at Boise State, biomedical engineering courses at the University of Texas Health Science Center at San Antonio and The University of Texas at San Antonio Joint Graduate Program, and courses in the Department of Electrical Engineering at Texas at San Antonio. She also interned at the McDonnell Douglas Astronautics Company in Huntington Beach, California. She received her bachelor’s degree in electrical engineering from Valparaiso University and her master’s and Ph.D. in electrical engineering from the University of Notre Dame. Schrader is a recipient of the Presidential Award for Excellence in Science, Mathematics, and Engineering Mentoring from the White House; the Hewlett-Packard/Harriett B. Rigas Award from the Institute of Electrical and Electronics Engineers (IEEE) Education Society; the Idaho Women Making History Award; and the WebCT Exemplary Online Course Award. She was also named one of Valparaiso University’s Top 150 Most Influential People. She received the 2013 Distinguished Educator Award from the Electrical and Computer Engineering division of the American Society for Engineering Education (ASEE) and was named an ASEE Fellow in 2017 for her outstanding contributions to the field, a rare honor conferred on only a small fraction of the society’s members. Schrader was also named an IEEE Fellow in 2014 in recognition of her leadership and contributions in engineering education. Schrader’s husband, Jeff, served for many years in the legal profession. The couple has a son, Andrew, who is pursuing a Ph.D. in mechanical engineering at Georgia Tech, and a daughter, Ella, who is in elementary school.